As a leading global supplier of cable protection systems for use in rail applications, PMA has developed novel, innovative, EN 45545-3 compliant fire barrier solutions for combination with its proven cable protection Systems. The unique PMA fire barrier adapters allow termination of a cable protection system to a fire wall. The adapter uses intumescent material to seal all cavities in the event of a fire and can be attached directly to the fire wall. It ensures that cables and wires can be fed through the fire barrier while retaining an E30 rating and above according to EN45545-3. These adapters are available in sizes M16 to M63 and can be adapted to any wall structure to ensure simple and safe assembly. In the event of a fire, the intumescent material ensures that two areas remain separated from each other for at least 30 minutes (E30) in accordance with EN 45545-3. The intumescent material is fixed within the adapter to block the transport of fire, heat and fumes. The material expanding to fill the cavities between the cables within the adapter. Intumescent materials (typically sodium silicate or graphite) swell as a result of heat exposure to many times their original volume. The PMA adapter use this material very effectively to seal cavities preventing heat, fire and gases from passing through. The Intumescent material within the PMA solution blocks transport of fire heat and fumes up to 30 minutes in accordance to EN45545-3. The Intumescent material within the PMA adapter solution blocks transport of fire heat and funes up to 30 minutes in accordance to EN45545-3. 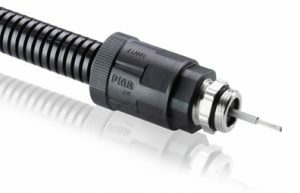 DEEspecially for jumper cables fused to connect carriage and locomotives in the rail industry, PMA offers a solution with the PMA strain relief fittings NVVZ and NKNZ which include a fire resistant cable gland from Pflitsch, providing strain relief and prevents fire, heat and funs from breathing through in event of a fire. Due to fact a screwdriver is required for dismantling, it‘s impeding unauthorised or accidental opening space-saving dismantling of the fittings. 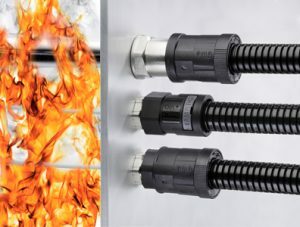 With a easy push-in assembly for maximum installation reliability, the components are easy to install and guarantee up to 15 minutes fire stop rating according to EN45545-3 and offer a excellent conduit pull-out strength. 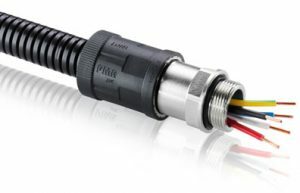 PMAFIX Pro NKNZ or PMAFIX NVZ fittings can be attached on either side of the adapter allowing connection with the EN45545-2 approved PCS, PCSL, VAM, VAML conduits, to achieve an EN45545-3 E15 rating in combination. This solution of PMA fire barrier adapter is designed to be used in combination with Roxtec wall seating systems. 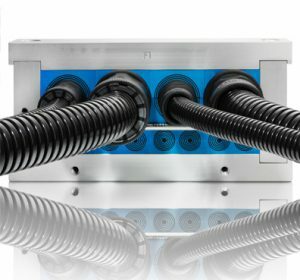 The combined PMA and Roxtec components provide a complete wall transit feed through system for cables and wires within a cable protection system providing protection against all kinds of mechanical and environmental influences. The components are easy to install and guarantee beyond E30 fire stop rating according to EN45545-3 for wall, roof and floor installations. The Roxtec RM PPS sealing module is a customized solution produced to order. Combined with a PMA 30mmm or 60mm fire barrier adapter it can easily be adapted to seal PMA conduits of various sizes in a wide range of applications achieving an E60 rating according to EN 45545-3. The intumescent material in the PMA fire barrier adapter expands upon exposure to high temperatures sealing wall transits. The solution is easy to install and due to its compact size can reduce the weight of the complete solution. EN 45545-1 contains basic definitions as well as general rules on how to classify rail vehicles. Train operating and train design categories are defined in order to assess fire risk. Hazard levels are defined based upon these classifications. EN 45545-2 describes the material requirements for the different hazard levels (HL1, HL2 and HL3). Table R22 sets the flammability, smoke emission and toxicity requirements for internal applications. Table R23 does the same for external applications. EN 45545-3 describes the fire resistance requirements for fire barriers. Unless designed with care, locations where cables within cable protection conduits are fed through fire barriers could represent potential weak points through which fire, heat or gas could penetrate. E15 is sufficient for several of the 10 installation situations and operating categories. E30, the highest requirement is specified for fire barriers between luggage compartments and passenger areas or the driver‘s cab for train operating categories 3 and 4. In such situations the fire must be prevented from breaking through for at least 30 minutes.